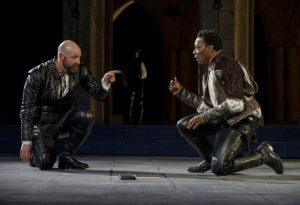 Corey Stoll (l) as Iago and Chukwudi Iwuji (r) as Othello, Delacorte Theater, Shakespeare in the Park. Photo by Joan Marcus. The story of Othello has always bothered me. Simply put, Othello has to be country-bumpkin gullible to fall victim to Iago’s plotting – smitten and jealous or not. Chukwudi Iwuji, in the title role in the Public Theater’s Shakespeare in the Park, turned in such a performance that I could almost believe Othello is that naïve. I have seen Othello more times than I can honestly remember. This production, though, is beyond memorable, especially but not exclusively because of Iwuji’s performance. Much of the play hinges on the performance of Iago, and Corey Stoll delivers the goods. He is both funny and horrific in appropriate measures, and Iago and Othello here are well-matched. Heather Lind as Desdemona rounds out a trio of performers whose work will be talked about for years. Almost inevitably, Othello the Moor has been played by a black actor with the rest of the cast white (and let us all cheer the passing of white actors in blackface). In this production. Director Ruben Santiago-Hudson has chosen an ethnically diverse cast, e.g., Peter Jay Fernandez as the Duke, Motell Foster as Roderigo, Flor de Liz Perez as Bianca and Babak Tafti as Cassio. I have maintained that, where a show has nothing to do with race, any actor is appropriate for any part. In a production where race matters, however, casting should go accordingly; an ethnic Viking playing Nelson Mandela, for instance, is doomed to fail. Yet, Santiago-Hudson has successfully challenged my presumption. Othello’s otherness can hinge on much more than skin tone, and here it does. I am grateful for the lesson. As usual, with the Public’s productions at the Delacorte in Central Park, the production crew shines doing outdoors what few would attempt indoors. The set, as always, is simple and flexible, and Rachel Hauck’s arches and columns are straight out of a Caneletto painting. The sound design of Jessica Paz has to fight early on with the occasional passing helicopter, but that’s the price for the magical setting and she wins the fight. The lighting, by Jane Cox, has to wrestle with the changing ambient light of the setting sun as the production begins and darkness edges into the park, and she is just as successfujl as Paz. Thomas Schall as fight director has the actors credibly wielding edged weapons rather than waving them at one another. The hair and wigs were historically accurate and well-executed by Matthew B. Armentrout. Top marks go to the costumes of Toni-Leslie James. It is difficult to describe just how good they are: the gold thread, the lace, the robes. Marvellous. Finally, there is the stage itself. The Delacorte doesn’t have a bad seat, and one is close enough to the action no matter where one is seated that one can see every expression on every face. And on a warm summer night with a breeze dancing through the audience, there is nothing better. As I said, I have seen Othello many times. This production is my favorite. Othello runs at the Delacorte Theater in Central Park, through June 24, 2018. For more information, visit The Public Theater website.